COMING SOON .. From Heartstring Samplery and inspired by a real place, located near the end of the Oregon Trail. 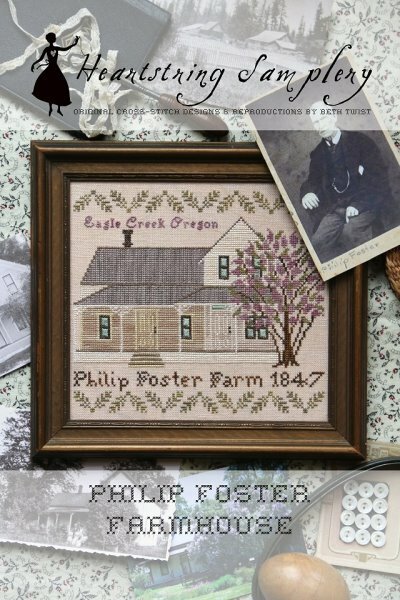 Inside the chart cover, you'll find historical details about the house and its original occupants, as well as a remarkable old growth lilac tree that is still growing today in the front yard. Shown stitched on 36ct Old Mill Java linen using Classic Colorworks (Bunny Honey, Poblano Pepper, Brown Hen, Eggshell), Gentle Art Sampler Threads (Endive, French Lilac, Pecan Pie, Roasted Marshmallow) and Weeks Dye Works (Grits, Molasses, Flatfish, Porpoise) with a stitch count of 122 x 105. The majority of the design is counted cross-stitch with one thread over two, but there is also a small portion of one thread over one (lettering over rooftop), and the window panes were satin stitched to give the appearance of glass reflecting a blue sky.